I’m not sure if every crafter is like me but my idea of shopping is almost always to shop at a craft store, scrapbook store or stationery store – I can spend hours just browsing through everything in the store, comparing prices, making mental notes of things I might want to buy in the future, basically just window shopping, before I start to feel tired or have the urge to leave the shop. That patience is much much short-lived compared to say shopping for clothes. Anyway, today I will share my last crafty haul with you to give you a glimpse of the things I buy and why I buy them. Reeves acrylic tube paints, set of 18 from Art Friend: I wanted some new acrylic colours, but couldn’t choose which colours i wanted to get so I decided to get a multi-colour set instead. I do like the Reeves brand quite a bit, I think that they have good pigments in their paints (I own their watercolour pan set), and their prices are rather affordable. Plus, the entire brand is having a discount at Art Friend’s once a year sale. The set also contained viridian hue, which for some reason I am attracted to (as well as all sort of greens as the moment), and apparently viridian hue cannot be found in separate acrylic tubes. Chinese calligraphy ink from Popular: I still have my old calligraphy brushes and paper from old school days and one day (one fine fine day) I am intending to break them out and use them in my crafts. Perhaps some chinese calligraphy writings (though my calligraphy was never good), and to use the ink like india ink perhaps? There is never anything wrong with having all sorts of black mark making tools in the craft room. Pilot Juice gel pen in Coral Pink from Popular: Pink is a colour I reach for pretty often because it tends to align with my emotions a lot. Coral is a really pretty shade of pink, something not so bright and rather sweet. I do recommend the Pilot pens and Juice gel series because it has good pen qualities. The pen writes really smoothly across the paper, and discharge an optimal amount ink in the process – meaning it doesn’t smudge as you write. It has a nice comfortable grip as well, so if you are looking for some coloured pens, the Juice series offers quite a lot of colours for you to pick from, as well as sets of multi-colours. Staedlter Lumocolor permanent marker from Popular: This is another brand I like to use because there’s mileage in the inks, and perhaps also a pinch of brand bianess there. Unfortunately, the refills are not available in Singapore or it will give even more mileage. Seems like the refills are only available in Germany (on Amazon, no less) and it is regretful that I missed my chance to obtain them when I was away in Europe for 4 months. Rubber carving block from Paper Market: These are Japanese rubber carving blocks that were on sale 2 @ 60% off so I thought I will get them to give stamp carving a try. I have never used carving blocks before, and till now I have not open the packets to give it a try so I can’t say much. But stamp carving has always been one of those things I’ve be drawn to because I like stamps, and I like the idea of handmaking something that you can call your own. It was just unfortunate that the tools require for stamp carvings are not cheap, and I am not prepared to invest in them just yet when I am not fully sure this is something I would like to continue in the long run. I do have an old set of woodcarving tool that looks like they were from my parent’s school days, and there are some similarities in the carving heads of the tool so this is what I will use in the meantime. 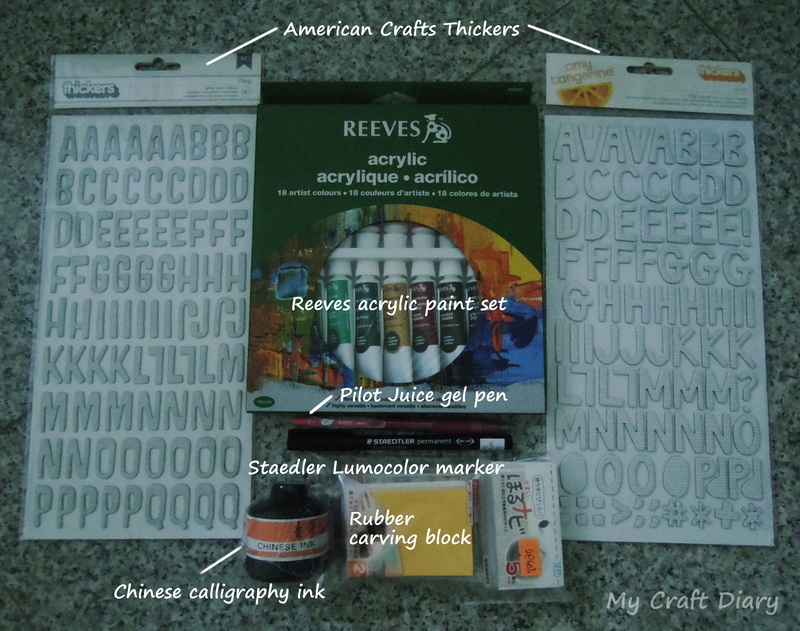 American Crafts Thickers from Popular (Urban Write): If you ever want to get some Thickers, always get them from Popular. I repeat, always get them from Popular because they are significantly cheaper. Granted, they do seem to offer less variety than scrapbooking stores like Paper Market, especially “limited edition” ones that American Crafts comes up with every new line/collection. But if you can find what you like at Popular, then get them there! Thickers are rather versatile, and one thing I really like about AC Thickers are the greater abundance of commonly used letters (e.g. ‘a’, ‘e’, ‘r’, ‘s’ etc) instead of like having the same number of letter stickers for each letter. This means you can use them more effectively for you don’t run out of the letters to form words that quickly! You can see a close up at the Thickers I got; I picked versatile fonts and colours so that I can use them for different kind of scrapbook layouts. Close up of the American Thickers I bought – Cecily on the top and Alyx on the bottom. And once again, I find myself typing more things than I intend to. Sometimes I wonder if I should film myself instead but I’m still not confident of that, finding myself tripping over tongues and words and forgetting the actual thing I want to say. Just a note on the links on the blog post: they are not linked to the places where I bought them because the stores I bought them from either have no online presence or have no online shop. They are linked so that you can see more about the things I have bought, and I am in no way affiliated to the links. And as the title also mentioned an update on my organising space from the previous post, I am pleased to say that I am currently in a much happier state of my cupboard once I have cleared out a space elsewhere to be used as a storage space. So bulky things like reams of cardstock and stock of page protectors have been moved out of my cupboard and out of my room to somewhere I can’t see but know it is there when I need to reach for them. This small little action had made all the difference because what is in my cupboard now are things that I would reach for and use. So if you are finding your craft room cluttered, identify the things that are merely in storage and move all of them somewhere else so that they do not interfere with your crafting. I mentioned in a previous post that I have gotten a new shelf for my craft area. Since then, I have been attempting to organise and move things around my craft area so that most of my supplies are localised within the shelf. Just earlier today, I went to Ikea and purchase some boxes that would fit nicely into the various compartments. Because I wanted everything to be perfect, I had procrastinated for a very long time, trying to make up my mind on what would be the best way to store all my supplies. Unfortunately for me, today’s organising stint had not left me feeling happy at the state of the cupboard right now. Everything has a place to go to, but I felt like it was overcrowding, which to me also meant messy and I’m feeling stressed that things are not as organised as I hope it could be. I’m too tired today to try to think of ways to re-organise my things so I’ll leave them as it is. Until I get that brilliant idea of how to arrange everything in a conducive manner. I probably sound too much like a perfectionist but really, I can’t work or focus on anything when I get the nagging feeling at the back of my head that tells me I’m not happy with the state of my workspace. At the moment, I am truly regretting getting ahead of myself and organising my stuff with the newly bought boxes because now I can’t even bear being in the room without feeling some sort of frustration, which could only be counter-productive to my art making. Sighs. I find that the things that annoys me the most are supplies that I have hoarded, and don’t really use normally. Things like my recycled materials, art supplies from days long past (still usable but I don’t like to use them because they don’t give me the results I want), homemade supplies that I thought I’ll give it a try to see if I would like to use them (not so much, but let’s see if I would use them more now that they are slightly more accessible and neater) and some non-paper ephemera that I thought I saved to do some sort of mixed media work (which didn’t work out because I decided that I don’t like too much dimension and honestly, mixed media isn’t my thing). Gotta work on these aspects, though I suspect that very soon I will start purging these hoarded supplies that are frustrating me the most. At the moment, I’ll revisit some organising videos that I have watched in the past, especially this video and hopefully gain some ideas on how best to store all these stuff. It’s funny how our emotions can change in a matter of minutes isn’t it? One minute I will feeling happy topped with all the inner squeals and next minute I find myself filling low and empty all over again. When people ask if I like dawn or dusk better, I like to reply dusk, because I like to end the day on a high note than to start the day on one, because there is a lot of time and opportunities after dawn for things to screw up the day. I had intended to post this traveller’s notebook spread on Instagram, but had scrolled through my Instagram feed first. Ever since I’ve been adding people within my social circle on Instagram, I’ve found myself much more self conscious of the things I’ve posted because people I know would see them. Silly I know, but I’ve still got a long way to go before I’m completely comfortable with sharing my true self with the people I know than the strangers I don’t. A spread from my Midori Traveller's notebook. Each page are done on separate days. The spread features heavily on watercolour scripting and I’m proud to say that I have reached the stage of liking the way I script my phrases after the down beginner’s phase where things don’t turn out the way you imagined it. I attempted a rainbow hue on the right page.. only to find out after I’ve started that I’ve begun with the wrong colour. But I made it work around the idea by following the colour wheel. Pleased to day that the colour transition improved as I scripted too so that’s definitely a new skill to add to my watercolour scripting. Talking about crafting and colours made me spirits lift again. I find it odd how my emotions change so easily, but I’m not complaining, as long as I still have something to depend on to lift myself up again. 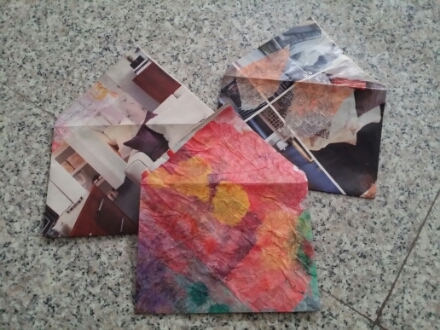 Does crafting means more to you than just crafting too? Sometimes, doors look like they are good opportunity lost. But when heaven closes a door, they always leave a window open, whether or not you can see them at first. You just need to be patient for a little bit, wait for the clouds to clear and you’ll see the beautiful window and angel that heaven has laid out and opened for you a long time ago. It surprises me how much this resonated with myself, even as I work on it. It’s been a long time since my art has been in sync with my journal; often it has just been journaling accompanied with colours or patterns or something that don’t speak the same as the journaling. Hence I hope this can continue, and that my interpretation of this has struck a chord with you too.